Bixonic recently released the Bixonic Expandora EXP-2000R, a reissue of the earlier EXP-2000. The Expandora has more going for it than a great name. It’s established a reputation as a great source for a variety of distorted sounds. It’s been used by Bush, Megadeth, ZZ Top, Bootsy Collins and other artists. The EXP-2000R retains the look of earlier versions, but improves on them by bringing to the front dip-switches that were previously inside the case. It also adds a switch to toggle between Bass and Guitar settings. 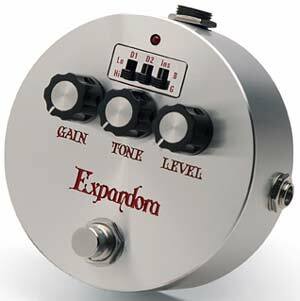 As a result, the Expandora is like having eight distortion pedals combined into one. The Expandora is housed in a brushed aluminum housing. Some players may not like its “tuna can” design, but it’s a refreshing alternative to the standard pedal block. The case feels solid and substantial. The overall build quality appears to be very good.